With a brand spanking new $15 in my wallet (new to me at least), I decided to take an extra group class this past week! Teacher’s pro partner was teaching and the topic was arm styling, which I need help with, so I felt like it was a good use of my winnings from the jack and jill dance. 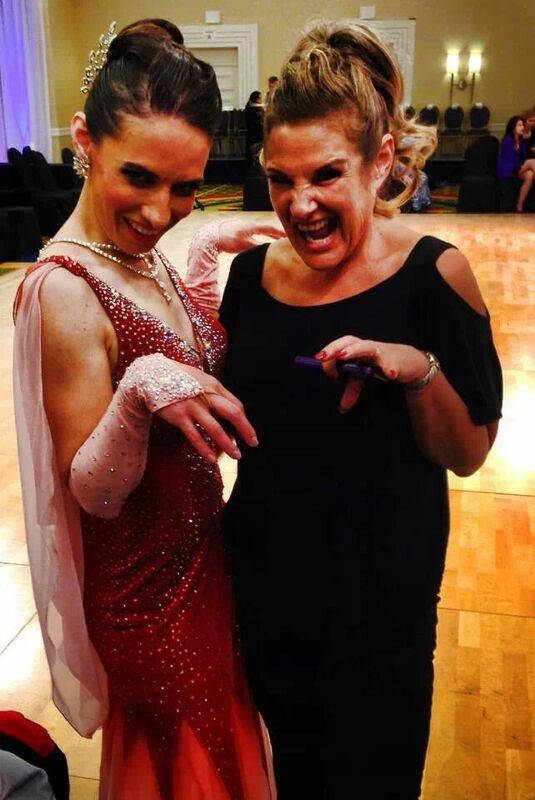 The main focus was on leading with your elbow as you took your arm out and back in when dancing patterns such as face-to-face, back-to-back in waltz, a cross-over break in cha cha, or an open fan in tango. The other focus was relaxing your arm, wrist and hand so you didn’t look heavy or robotic. For me, this idea falls on my list of required contradictions. Because basic proper frame, as far as my arms go, starts with rolling my shoulders back and down, pushing my elbows upward, and then turning my wrists so the inside of them faces inward (like a ballet first position). Three body parts moving/twisting in three different directions. Now hold that lovely form and relax at the same time. Right. Of course, that’s not the whole truth of it. But I’m still working to find that balance between being firm and strong yet relaxed and flowy. Because you don’t want to look like all strength in waltz, it’s not that kind of dance. One thing that happens to me is the strength in my back, shoulders and elbows gets translated into tension in my wrists and hands. My wrist kept popping up at my first comp because of tension in my shoulder and arm. The teacher pointed out that if we were to touch our face as part of our styling, we wouldn’t want to touch it with a hand that was stiff and tense. It would look awkward and more like we were poking ourselves instead of a nice brush across the cheek. The hand and fingers need to be relaxed. She gave us a small exercise of just petting our arm with our hand to help remind our brains how we want the hand to feel, which will equate to how we want the hand to look. I may be spotted petting myself at future comps. As we worked on soft, flowy arm styling that you would use in a dance like waltz, she offered another little gold nugget of information. In a pattern like face-to-face, I normally extend my arm up and then out to my side, and then sweep it forward as I dance forward. The instructor encouraged us to use more of the space around us. If we had friends or family watching us and they happened to be behind us as we were dancing face-to-face, we wouldn’t want to cut them off by just extending our arm to the side. If we stretched our arm more behind us (with the body so you don’t “break” your arm at the shoulder) and even turn our head to follow our arm as it comes forward, we can acknowledge those audience members. Also a good tip in the event a judge is behind you! A follow-up lightbulb to this lightbulb happened in my private lesson the next day. I kept feeling like I was throwing myself off balance when I would try to really stretch and extend my arm sweep while dancing face-to-face. Teacher pointed out that I was taking my second step too early. I needed to take my first step and wait for my arm to finish its sweep before moving my feet again. This is a recurring theme, me moving too soon. But that’s a different post. 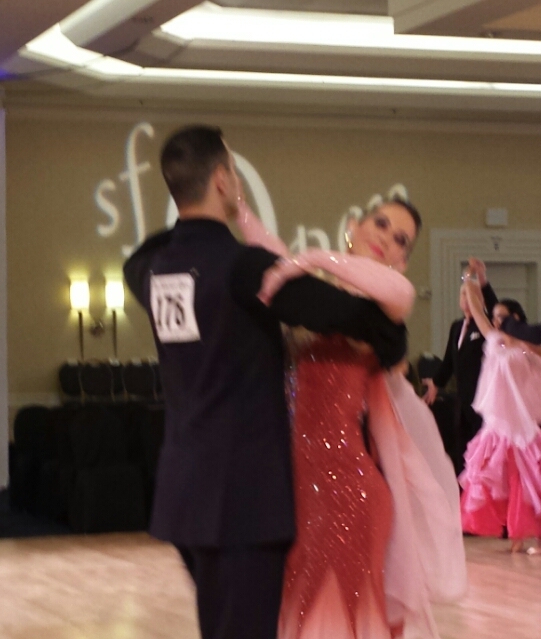 The final lightbulb of the group class came when we switched to sharper arm styling for dances like tango and cha cha. When I do an open fan in tango, my arm tends to fling behind me if I’m not careful because I throw it out with such force and don’t have control of the momentum. The teacher offered a simple image – imagine you have something in your hand that you are throwing in whatever direction your hand should go. This little tidbit immediately helped me feel like I had better control of my arm movement because the momentum was directed in the direction I chose. Ah ha. So I hope these lightbulbs are useful for someone out there. These posts are a challenge for me. It’s easier for me to describe what’s going on in my head than outline learnings from a lesson or group class. For one, what if I’m remembering wrong?? Time after time, I think I understand something in a group class and a week later, Teacher corrects what I’m trying to apply. For someone already swimming in self-doubt, it doesn’t help my campaign to convince myself that I do know what I’m doing. There is always more to learn though, and if I’m being fair, it’s often a tweak rather than a total correction. Still, I would hate to think I’m passing along information that is misleading or flat out wrong! So please take it all with a grain of salt and remember I haven’t been dancing for that long. At the same time, I do hope, as always, to encourage, inspire and motivate! See you on the dancefloor!